I vividly remember the first time I had banana pancakes. I was in college and staying at a quaint little bed and breakfast in southern Rhode Island. As soon as I put the first bite in my mouth, I knew that I had to have these pancakes in my life on a regular basis. I am hundreds of miles from that bed and breakfast now, but the banana pancakes aren't far away. 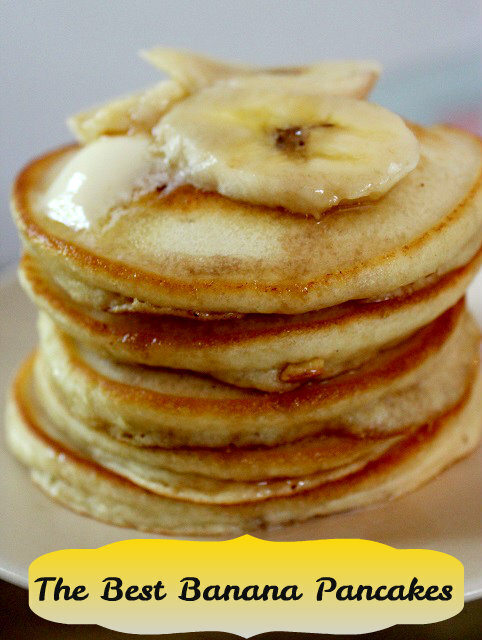 Since I don't return to Rhode Island very often, and I have no idea what the name of the B&B is, I decided to research some recipes and develop my very own recipe for banana pancakes. 1. In a bowl, combine the dry ingredients: flour, sugar, baking powder, and salt. Set aside. 2. In a separate bowl, mash half of one of the bananas. Add the buttermilk and eggs to the mashed banana. Stir until well blended. 3. Add the dry ingredients to the wet ingredients until just combined. Batter will be lumpy. Do not over mix. 4. Slice the remaining one and a half bananas into 1/4" thickness. Set aside. 5. Heat a griddle or pan over medium heat. Add the oil to the pan and swirl to coat the bottom. Or if using a griddle, use a pastry brush to coat the griddle top. 6. To the hot griddle, measure 1/4 cup for each pancake, keeping pancakes about 2 inches apart. 7. Just as holes are starting to form, add a few sliced bananas. 8. Cook until holes form on the tops of the pancakes and the undersides are golden brown, about 2 minutes. Carefully slide a spatula under the pancakes and turn them over. Cook the other side until it has fluffed up and the bottom is golden brown, about 1 to 2 minutes. Transfer to a plate. 9. Repeat until you've used all the pancake batter. 10. Top with butter and sliced bananas. Drizzle with warm maple syrup. Tip: No buttermilk? No worries! Add 1 tablespoon of white vinegar to a one cup measuring cup. Fill the measuring cup with milk. You've got buttermilk!